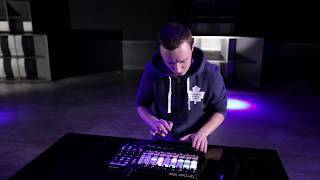 The brand new APC40 Ableton Performance Controller was created due to the close partnership with Ableton and is the perfect controller for live performances. 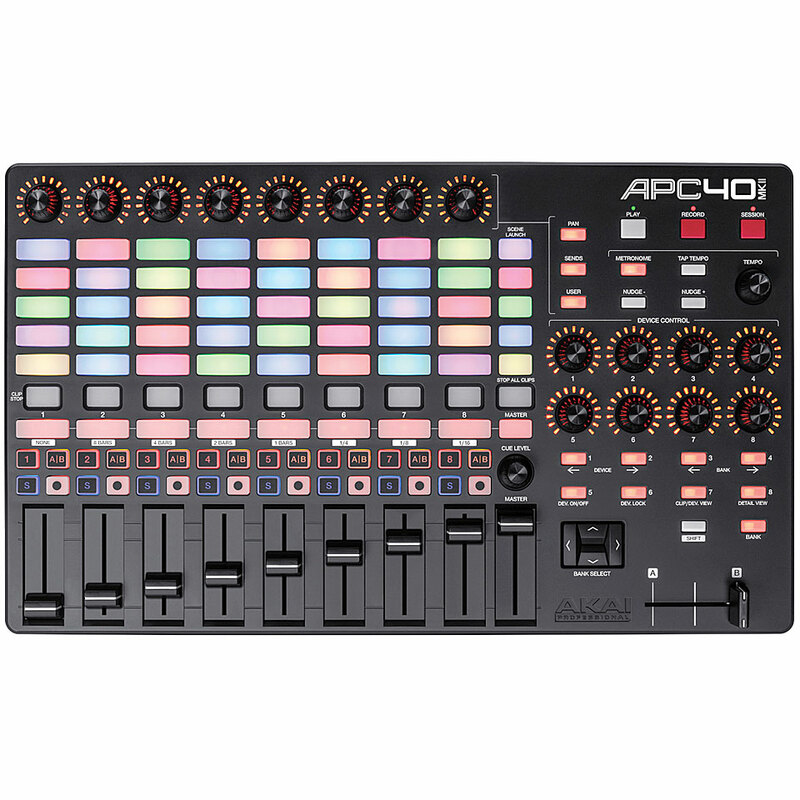 Equipped with an integrated clip matrix with multicolour LEDs and premium conrols includng aa changeable crossfader, the APC40 is ideal for every user who works live or in a studio due to the bi-directive communication between hard- and software. Due to the close cooperation with Ableton no controller operation is necessary during access. 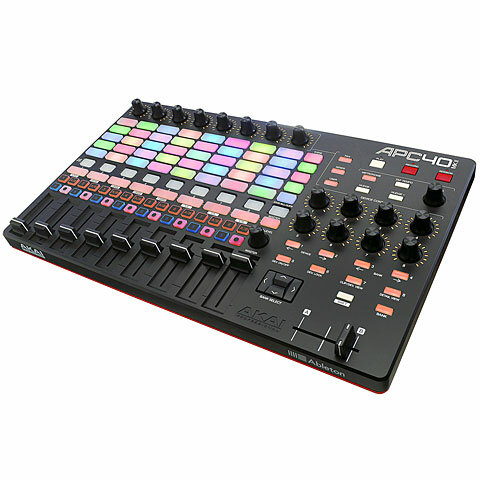 Due to the concentrated cooperation between Akai Professional and Ableton when developing the APC40 for live performances a special focus was put on the comfortable connection of the controller to the live software. This way an operation of the software is no longer necessary. In order to start a performance straight away, only a simple USB connection between laptop and APC40 is necessary. Experienced live users can change the operation of every field and configurate each controller depending on the type of performance. The communication between the APC40 and Live is in both directions. This unique bi-directive communication enables feedback from the software to the controller. The 40 triggers and LED rings of the clip matrix show the status of the live software in real time: which clip has been loaded, which clip is playing or which clip is recording. Different coloured features show the status of the clip. This workflow is quite unusual, but becomes routine after a time. The APC40 has 16 additional controllers which are each surrounded by an LED ring. Thanks to these LED rings the parameters can be read on a dark stage. Due to the visual feedback the user focuses more on the music and not on the display when working with the APC40. The computer quickly becomes a side effect and does not have to be concentrated on. Ableton chose Akai Professional as a partner because Akai Professional is the market leader for professional and robust manufactured controllers. From the legendary MPC Series which completely changed the world of music production to the unique MPD and MPK Controllers, all equipment from Akai Professional is prefered by musicians, DJs and producers when it comes to the right feeling. The robust chassis of the APC40 is made of metal and rubber. The solid controllers and faders are ideal for exact operations. The APC40 even has a professional, changeable crossfader. For a quick start you don't need to be an expert. The APC40 is delivered with a special version of Ableton Live Lite. Users who already know Live can find a free patch for updates of their Live full version, so they can use all the advantages of the APC40. The APC40 has two banks with eight switches. The first bank controls the global parameters, are for immediate access to the main sends, panorama and other important parametres. The eight switches of the second bank are connected dynamically to the parametres of the chosen track. At the same time eight track parametres can be operated. If you switch over to another track then the access is automatically changed. The special clip status displays and feedbacks can only be featured by the matrix of the APC40. The matrix is not limited to 40 clips: it can be scrolled and pushed whereas an endless number of permits is made possible. The APC40 has several controllers. The eight global controllers can activate four controller banks; the eight track controllers can each operate up to nine different track parametes whereas all together 72 dynamic controllers are available. The channel fader, bus fader and a crossfader enable a comfortable operation of the adjustments. Additionally, operation features and two selectable pedals are available for tap, tempo nudge, record enable, and solo/cue functions. Created in cooperation with Ableton the APC40 is the most advanced live controller for modern performers. This item was given an average rating of 4.3 out of 5 stars. No review about this product has been written yet. 10 ratings exist without a text or these reviews are written in another language. · Show all articles of the brand Akai.